Seth Rollins is going to WrestleMania! The Kingslayer made his entrance into this year’s 30-Man Royal Rumble match from the #10 position and faced an uphill battle from the very start. Not only did he have to shake off being mauled through the announce table by the “Almighty” Bobby Lashley, turned inside-out by a rabid Braun Strowman at ringside, and tossed around by a surprise Nia Jax whom he could’t have possibly planned for, but Rollins had to outlast two-thirds of the Rumble field including the likes of Jeff Hardy, Rey Mysterio, Samoa Joe and of course his most bitter enemy, Dean Ambrose. While the Kingslayer hasn’t specifically stated which title he plans on challenging for on the Grandest Stage of Them All, all reports in recent weeks have pointed towards Rollins facing Brock Lesnar for the Universal Championship at WrestleMania 35. 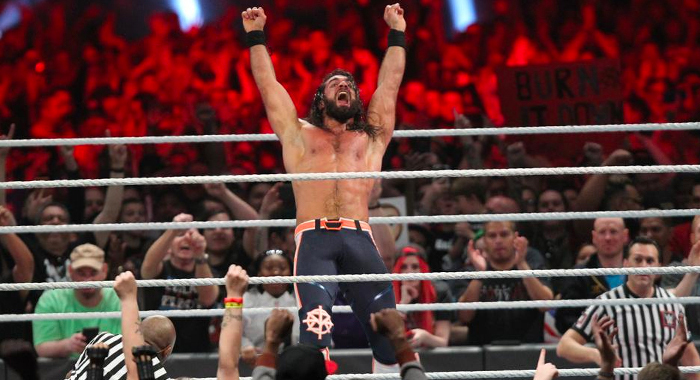 Rollins actually has a pretty stellar record at WWE’s annual April classic. While The Shield picked up back-to-back victories in their first two years, his singles career really took off when he famously cashed in Money in the Bank in the MIDDLE of the WrestleMania 31 main event, stealing the world title right out from under the noses of both Brock Lesnar and Roman Reigns. After sitting out the next year injured, Rollins came back strong with a win over Triple H himself at WrestleMania 33, and in 2018 he of course won the Intercontinental Championship in a triple threat match also involving The Miz and Finn Balor.